For the second year in a row, we’re using Equal Pay Day to report on how we’re doing in terms of compensating all our team members with equal pay for equal work. While most companies support equal pay in theory, very few stand behind their actions and release the actual data around differences in pay by gender. Transparency plays a most critical role in staying accountable for achieving equal pay. 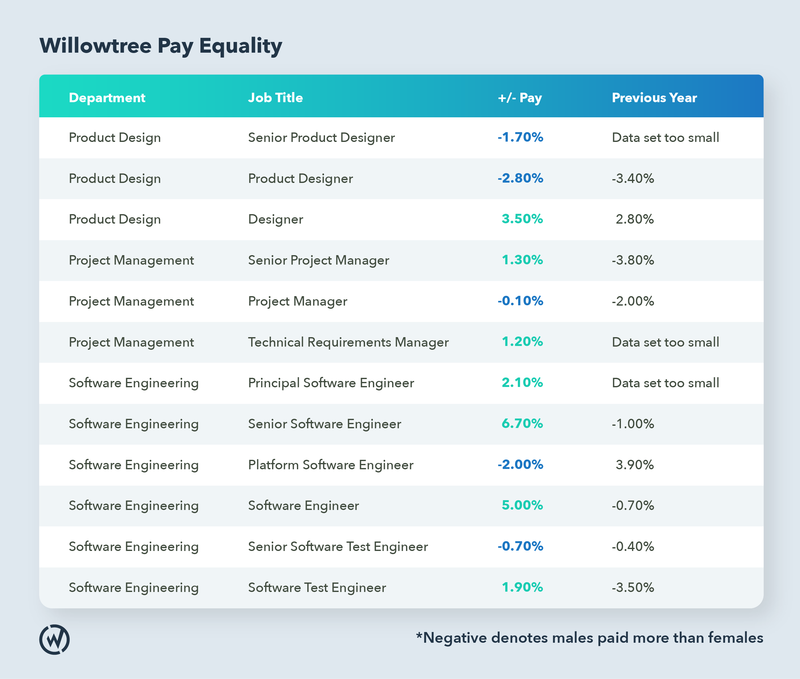 Below we show WillowTree’s pay by self-identified gender for Q1 2019, compared to previous years. Note that we are not showing non-binary pay because the low numbers of those identities in any given job category would make it possible to identify individuals’ salaries. Negative numbers mean women are paid less than men on average at that position, and positive numbers mean women are paid more than men. Note that we did not take other factors such as tenure and performance into account, so there will always be some discrepancy until we get to larger statistical team sizes. Overall, we continue to be very very proud of where we are: in no job category do women average less than 3% of pay vs. men. In several categories women are paid higher than men, including in most software engineering areas where the tech industry has a history of under-compensating women. There is more work to do, and we will remain ever vigilant on this issue; we’re also aware that relative compensation alone is just one measure of ensuring everyone is being treated equally and given equal opportunities. WillowTree is taking active steps by implementing company-wide Unconscious Bias training this year and continuing to conduct annual inclusion surveys (and taking action where disparities exist). We encourage all our fellow companies in the technology space to embrace transparency and real accountability and join us in releasing their gender pay data.